In the 2016 elections, Hillary Clinton won New York City with 79% of the vote. In Manhattan, that number was 86.6%. On the island where Donald Trump first made a name for himself as a real estate developer, fewer than 1 in 5 residents voted for him. We decided to look at this situation through the lens of a single Manhattan apartment complex. Who would want to live in a Trump-brand building in a strongly anti-Trump borough? During the election season, the residents of Trump Place, which occupies a stretch between 59th Street and 72nd Street on the Hudson River, began to complain about the building’s name. Hundreds of tenants signed a petition demanding that the Trump name be dropped. The controversial Republican candidate no longer had a stake in the building, and its new owners were quick to acquiesce. After Mr. Trump became President Trump, the buildings, along with the doormen’s uniforms, were stripped of the Trump brand. Did Trump Place experience an uptick in vacancies as a result of its branding? Were prices negatively affected? And, after the complex rebranded itself as 140, 160 and 180 Riverside Avenue, did the situation turn around? Even though a decent amount has been written about condo/co-op sales, less has been written about rentals. At RealtyHop, we’ve designed a search engine to make it as easy as possible for New Yorkers to find investment properties. To that extent, we use data from RentHop (our sister site) to get the best possible estimate for a property’s rental potential. As a result, we have a massive database of New York apartments to comb through. 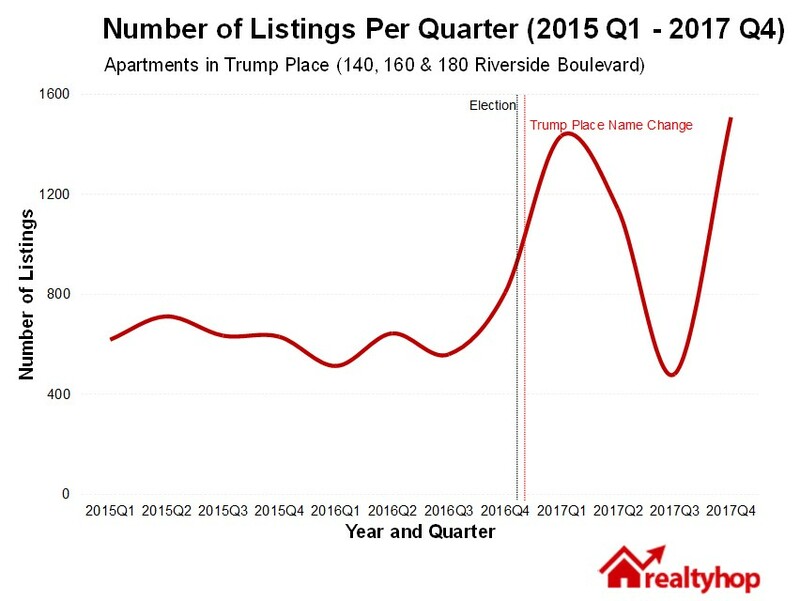 We cracked open this dataset to discover whether or not the Trump name influenced the number and price of apartment listings at the buildings that, until recently, bore the President’s name. When an apartment becomes available for rent, its owners can list it on RentHop, where users can search for apartments using a variety of criteria. We plotted these rental listings for Trump Place over time and found a huge uptick in listings available around the time of the election. The number of listings peaked a few months later, spiking to nearly twice the previous year’s numbers. A year after the rebrand, listings levels are still much higher than they were pre-election, indicating the former Trump Place may still be in a tumultuous situation. On the price front, we noticed that while the year before the election saw some dips and spikes, there was no clear price trend. For 1-bedrooms, which are the most common unit in the complex, the average price was $3,689 before the election, which has dropped only 4% to $3,546 today. In the chart below, we’ve plotted the number of listings for Trump Place rentals over time. It’s easy to see the gradual increase in the number of listed rentals over the course of the election season, followed by the gradual decline after the election and the subsequent name change, which are marked on the chart. In the year preceding the election, the number of apartments listed in Trump Place remained stable. Through the middle of 2016, the number of listings in the complex didn’t increase or decrease more than 20% from quarter to quarter. But in the third quarter of 2016, the number of available rentals leaped up 44%. As then-candidate Trump’s campaign gained steam—and headlines—more and more apartments went on the market. In the first quarter of the Trump presidency, the number of listings lept 77%, peaking at nearly three times the previous year’s numbers. The number of listings began to decline, then bottomed out in the third quarter. Today, however, it seems that there are more apartments publicly listed in the former Trump Place than at any point over the past three years, including the post-election peak. Though Trump Place has changed its name, we wanted to see if apartments in the complex are going for lower rates since the uproar over its branding. In order to determine if the campaign season and the election influenced prices at Trump Place, we looked at the price of an apartment around the time of the election and compared it to the year before and the year after. The chart below compares prices for apartments in the buildings at the end of 2015 to prices at the end of 2016, when the election took place. We can see that prices for studios and 1-bedrooms didn’t change much, though prices for 2-bedrooms dipped and prices for 3-bedrooms spiked. There could be some kind of political division between people who get different-sized apartments, but, as we’ll see in the next chart, which compares late 2016 to late 2017, it seems plausible that these price fluctuations are natural housing-market volatility. It looks like 2-bedrooms recovered much of their previous rental value in the year following the election, while studios and 1-bedrooms didn’t see much price change. Though it’s true that 3-bedrooms dropped a bit in price over the course of 2017, this can be partially explained by an apparent softening of the Manhattan luxury rental market. In general, between 2015 and 2017, we didn’t see a huge change in prices at the Riverside Boulevard complex. Even before the President was sworn in, we started seeing more apartments listed for rent in Trump Place. We saw a huge spike in listings around the election, with the number of rentals peaking in early 2017, a few months after the complex changed its name. In the end, rental prices didn’t turn out too different, though we saw a slight drop for 1-bedrooms, which are the most common units in the complex. Though the number of available rentals bottomed out in mid-2017, the last quarter of that year saw another surge in apartments for rent. It’s not clear whether these renters are politically motivated or whether they’re just planning on moving to Jersey City. Either way, it looks like there are a few more vacancies than usual at 140, 160 and 180 Riverside Boulevard.